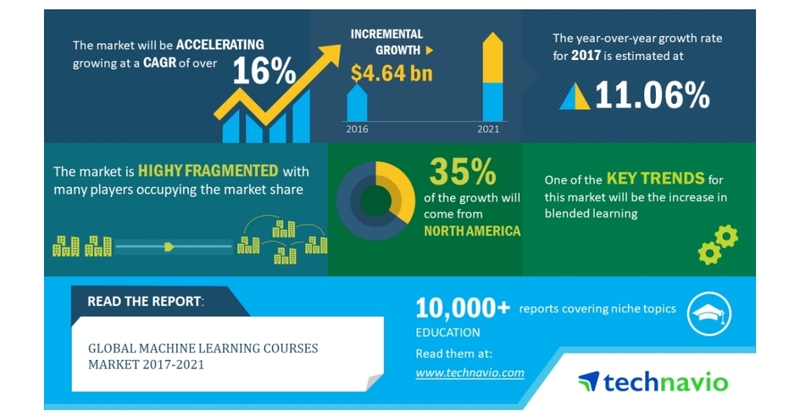 LONDON–(BUSINESS WIRE)–According to the market research report released by Technavio, the global machine learning courses market is expected to accelerate at a CAGR of more than 16% during the forecast period. Affordable and cheap storage of large volume of data by using machine learning is one of the key factors triggering the growth of the market. This research report titled ‘Global Machine Learning Courses Market 2018-2021’ provides an in-depth analysis of the market in terms of revenue and emerging market trends. It also includes an up-to-date analysis and forecasts for various market segments and all geographical regions. In 2016, the non-academic sectors accounted for 78.38% of the market share. With all the growing technological advancements and innovations in various fields, the non-academic sector will propel the growth and have a high market share in the next five years for the global machine learning courses market. The increase in blended learning is an emerging trend in the machine learning courses market space. The emergence of blended learning models has strongly contributed to the demand for machine learning courses, as many vendors in the market are focused in providing classroom sessions on machine learning courses along with digital content support because of the demand for instructor-based learning sessions. For instance, in India, Jigsaw and Simplilearn are offering machine learning courses via blended learning, meanwhile global players such as edX and Udacity are offering online courses.